Get your paws on this great item! 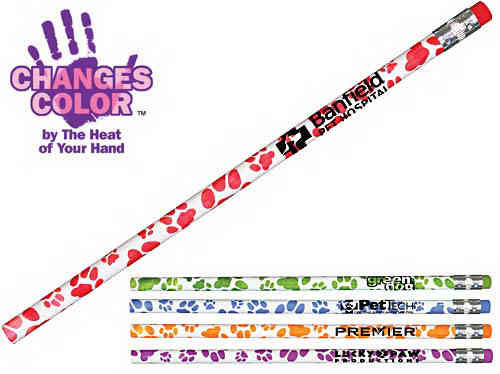 The Mood Paw Print Pencil is a quality #2 graphite lead wood pencil featuring a silver ferrule and matching eraser. This cool item changes color by the heat of your hand. Choose this American-made item as your next fun favor to promote your business during fundraising, charity, and animal care events. Warning: Severe weather conditions may affect the mood change. Order yours today.